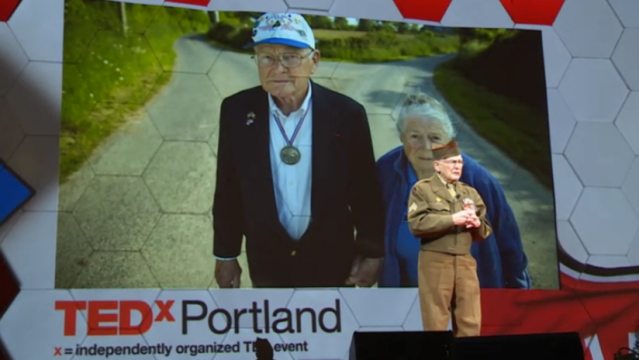 This past weekend I had the pleasure of attending TEDxPortland, which had the topic of “Perfect”. The line-up of speakers was truly breathtaking. The experience in the room ranged from designing the Jordan brand shoes at Nike, to leaving a sure thing as a CEO to open a start up, to turning your life around from being a felon into a thriving member of society, to being Macklemore. These are all people that I could talk about as impactful, brilliant, and even life-changing. However, I want to talk about Frank Moore, and the perfection of love. Frank is 91-years-old. He is an avid fly-fisher. But there is much more to Moore. He was in the army as a young man, fighting in WWII. He survived Normandy, and fought many of the big battles we talk about in history classes. He was part of the liberation of Dachau. He has been married for more than 75 years. I honestly can’t even begin to express the connection I felt to this man’s story. At one point he said he had too many stories, and to come by for a cup of coffee and he would tell you them. I am seriously thinking about taking him up on that offer. 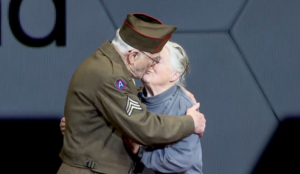 At the end of his talk, his wife came on stage. Their faces immediately light up, and beaming they held hands to a standing ovation from around 3,000 people. After planting one on his beautiful bride, they made their way off stage. 5 minutes later we were informed that #FrankMoore was one of the top three trending hashtags in North America. Is there anything better or more powerful than love? I don’t think so.